Moose Jaw, Sask. — The Moose Jaw Warrior who had the Prince Albert Raiders’ number all series proved to be the difference in the teams’ Game 7 elimination match Tuesday night. Forward Brayden Burke scored the game-winning goal (his second of the postseason) with less than five minutes to go in the game, putting the Warriors up 5-4 on the Raiders and sealing his team’s fate as the winners of the Western Hockey League quarterfinal playoff series. Moose Jaw now advances to the Eastern Conference semifinals where they’ll play the Swift Current Broncos, while the Raiders end their 2017-18 season. The loss marks the end-point of the Raiders’ overage players’ WHL careers; that group includes forwards Regan Nagy, Jordy Stallard and team captain Curtis Miske. But he underscored the lifetime’s worth of memories he now has after serving as the Raiders’ captain this season. That included a stretch of nine-straight wins and 11-straight games without a regulation-time loss through late February and early March; the Raiders used it to solidify their spot in the postseason and knock out their divisional rival, the Saskatoon Blades. 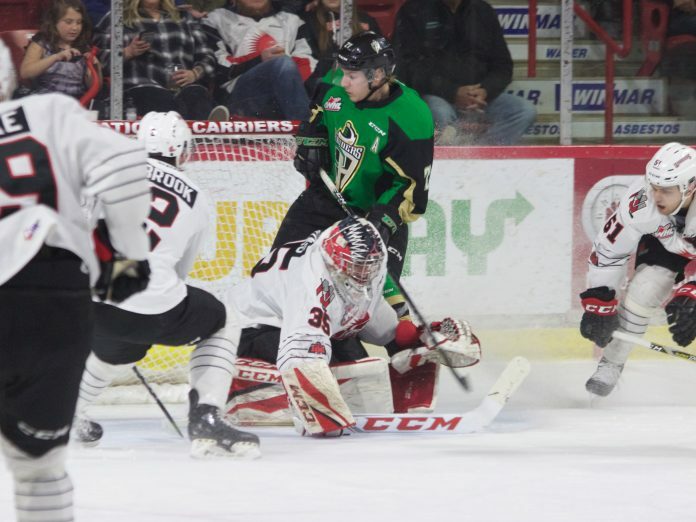 Regarded as the underdogs against the WHL-best Warriors, the Raiders found themselves in a 3-1 hole through four games of the best-of-seven playoff series after tight, back-to-back-to-back losses in Games 2, 3 and 4. Prince Albert kept grinding and it worked out for the club. They used heavy, physical forechecking to pressure the Warriors into mistakes and create enough offensive success to emerge with wins in Games 5 and 6, forcing Moose Jaw into Tuesday’s elimination game. The game could have gone to either team. The Raiders again used their systemic, physical forecheck to open the game with an early lead through the first six minutes. Justin Nachbaur and Parker Kelly put the Raiders on the score board first. Moose Jaw forward Jayden Halbgewachs scored his second playoff goal 1:24 later; then Ryan Peckford was credited with a Warriors goal after an errant pass from a Raiders defenceman took a bad bounce off a skate into goalie Ian Scott’s net less than 30 seconds later. The Raiders kept pressing: Kelly tipped in a point shot from Brayden Pachal at the mid-point of the period to put his team up 3-2. The first period ended with Prince Albert holding the advantage, both in terms of momentum and offensive chances. 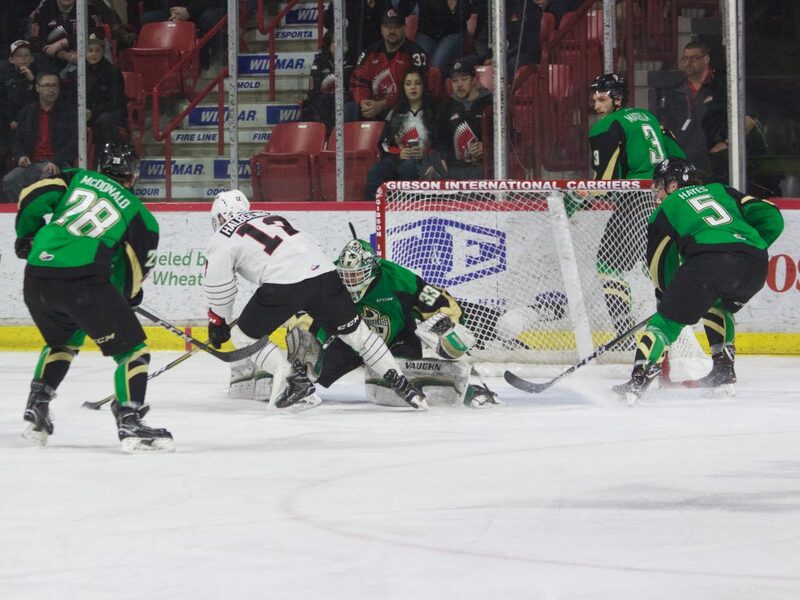 The second period almost ended in a scoreless draw, except that Warriors forward Justin Almeida – the other Moose Jaw skater who seemed to get the better of the Raiders this series – evened the score at 3-3 with a deadly wrist shot from the slot while on the power play at 18:09. The momentum generated from that goal seemed to carry Moose Jaw into the early stages of the third period; Almeida eventually scored again, at 11:01, to put the Warriors up 4-3. “I thought in the second and third period, we just didn’t generate a lot,” Habscheid said. “We spent too much time on the defensive. We didn’t put a lot of pucks on net, didn’t create a lot of offence. I thought we were maybe a little bit tentative in the last two periods. “Maybe experience comes in there a little bit,” he said. Much like they’d done all season, the Raiders used their vaunted penalty kill to fight through that adversity and tie the game at 4-4; Pachal had the puck and an open path at the Warriors’ blue line to skate in on goalie Brody Willms. The Raiders defenceman didn’t miss, sniping a wrist shot that beat Willms top shelf to tie the game 4-4 with 4:20 left in the period. But with the help of his power play unit, Burke did Pachal one better, firing a wrist shot from the slot top shelf on Scott to give his team the 5-4 lead and the eventual series win. The goal was his sixth against the Raiders, marking his 14th point this postseason. Burke led his team in playoff points and goals against the Raiders; Almeida was right behind him, with 5 goals and 11 total points. “They played real hard,” Burke said of the Raiders, explaining that he thinks his team is now better prepared for its round 2 series against Swift Current. Warriors head coach Tim Hunter echoed Burke’s comments when assessing the series win. “It’s a big relief. We were afraid of that team. They’re a good team; they play hard, they’re well-coached. “Marc did a great job with them; Dave (Manson) with their defence getting them ready to play playoff hockey. They don’t have a lot of playoff experience, but they play really hard. Our players really became afraid of them – they were in the series and we were in trouble. We played our best game tonight,” Hunter said. Like Miske, Raiders alternate captain Parker Kelly couldn’t hold back his tears as he processed the series loss. 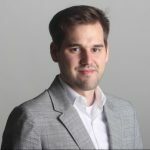 He and Miske both emphasized how tight-knit and close the Raiders were this season, strengthened by their playoff run and Tuesday’s tight, emotional loss. “We’re still pretty proud of them,” Habscheid said. “The way they competed and how they played and how they conducted themselves.